New Delhi, Feb 7 (IANS) The Rajya Sabha was on Thursday adjourned for the day amid sloganeering by the opposition soon after it met at 2 p.m. after an earlier adjournment. As the House resumed discussion on the motion of thanks on the President's address, a number of opposition MPs came near the Chair's podium and started shouting slogans against the government. 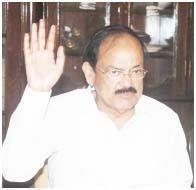 Chairman M. Venkaiah Naidu adjourned the House for the day after his appeal for restoring order in the House and resume the discussion was ignored by the agitating members. They demanded that the government bring a bill to ensure a sufficient quota in university faculty for SC, ST and OBC candidates and negate the court's order on a new 13 point roster. As per the court's order, the reservation for SC, ST and OBC candidates in faculty positions would be decided separately for each department of a university instead of the earlier practice of taking the entire university as a single unit. The opposition said the new regime would harm the interests of the backward classes as the total number of positions through this criterion would come down significantly. They also demanded that till the time the bill is brought or the case is decided in the Supreme Court, there should be no recruitment of teachers in universities. The issue was raised by members of the Samajwadi Party, Bahujan Samaj Party, CPI-M and the Rashtriya Janata Dal while MPs from other opposition parties associated themselves with the demand in the morning. Addressing the members concern, Human Resources Development Minister Prakash Javadekar said that since the new 13-point roster had come from the Allahabad High Court order, the government had already filed a review petition in the case. However, the members were not satisfied with the Minister's reply and started shouting. The Chairman had then adjourned the House till 2 p.m.